Industries & Commerce Assam, Extension Officer & Economic Investigator Admit Card/ Call letter Download. - Jobs4NE : Jobs in Assam and North East India. 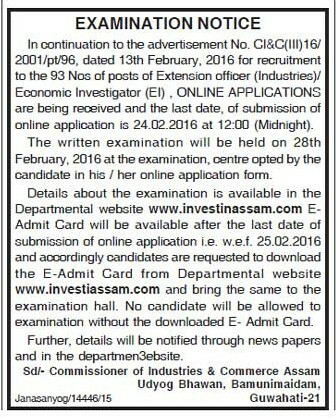 Industries & Commerce Assam, Extension Officer & Economic Investigator Admit Card/ Call letter Download. The candidates who had already applied for the post of Extension Officer (Industries) and Economic Investigator (EI) under the Department Industries and Commerce can download their admit cards from below given link w.e.f. 25/02/2016. Candidates are also requested to visit the official site www.investinassam.com for more details.